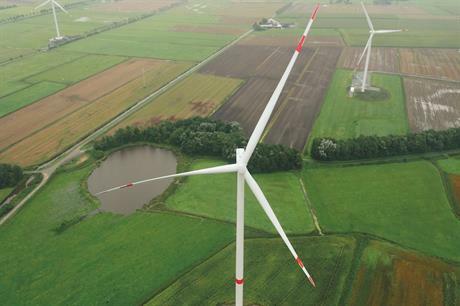 GERMANY: Senvion has installed the first prototype of its 3.6M140 turbine, using Eco Blade Control (EBC), at a test field near Husum, northern Germany. The 3.6M140 EBC, one of Senvion’s largest onshore turbines, is designed for moderate and strong wind speeds, and uses Eco Blade Control (EBC) technology, which optimises load management. The rotor blades are made with RodPack technology, which uses aligned fibre reinformcement as a substitute for glass fabrics as the main girder in the blades, allowing a lighter design. To date, the prototype also has the largest rotor diameter (140 metres) of Senvion’s 3MW series. The manufacturer is currently developing an uprated 3.7MW turbine with a 144-metre diameter for the Murra Warra project in Australia. When the German manufacturers unveiled the model at WindEnergy Hamburg last September, CEO Jurgen Geissinger said its larger rotor would increase yields 20% in wind speeds of 7.5m/s. After the prototype’s installation, Geissinger said: "Even with the larger 68.5-metre rotor blades, the 3.6M140 EBC can be installed in the same amount of time as a smaller turbine, ensuring an effective solution for our customers." The Windtestfeld Nord is just three kilometres from the North Sea and offers ideal wind conditions for testing and certification, Senvion said. Serial production for the turbine has already begun with further installations planned for this year, the manufacturer added.